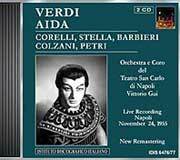 On 24th November 1955 Franco Corelli appeared before the audience of Naples’s Teatro San Carlo as Radamès in Giuseppe Verdi’s Aida. That memorable soirée was broadcast live by RAI and tape-recorded by an amateur. IDIS now publishes that recording, cleaned of some of the worst sound flaws that marred the original tape. This digital remastering allows us to enjoy one of those thrilling soirées that were common in Italian Opera houses in the 1950s, and which today are greatly missed.